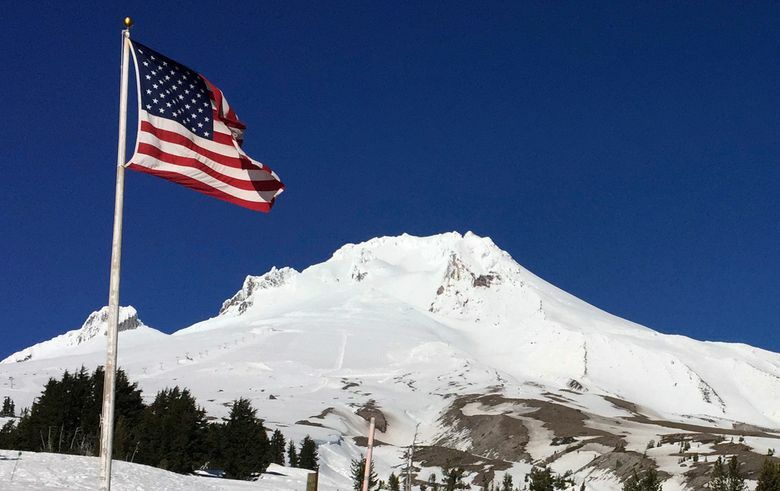 PORTLAND, Ore. (AP) — Members of the Mount Hood rescue last week to retrieve a climber at the top of the mountain say they’re glad the man called authorities for help in the midst of a suicide attempt and were happy to get him to safety. Capt. Phil Cole, part of the Air Force Reserve based in Portland who led a pararescue squad that assisted in the operation, said the climber seemed dazed after getting off the mountain. He shook the hands of all the rescuers after and thanked them before being driven to a hospital for evaluation. “For us, if someone needs help, we’re going to help them the best we can and sort the other details out another time,” said Cole, who said Friday marked the third Mount Hood rescue he’d been part of this year. The Clackamas County Sheriff’s Office identified the climber as a 27-year-old man, who called 911 from the mountain July 12 saying he’d taken a lethal dose of insulin. Six Portland Mountain Rescue volunteers reached the man at the summit and they realized they needed a chopper. Blackhawk helicopters are often used during rescue missions, Cole said. But in this case, a larger CH-47 Chinook was needed because it was a more powerful aircraft for the 11,250-foot summit elevation. The Blackhawk could operate comfortably up to 9,000 feet, he said. Cole and lead pilot Chief Don Ford, a flight instructor with the Oregon Army National Guard, said the original plan was to hoist the climber and six rescuers off the mountain, but they later realized their Chinook didn’t have all the equipment necessary to do it. There wasn’t enough time to get another. If for some reason an air rescue wasn’t going to work, Cole said, the backup plan was to wait until around 2 a.m. when the weather got colder, hike to the summit and set up a system to lower the climber down the mountain. He estimates that would have taken 7 to 8 hours from start to finish. Ford, based in Pendleton, said he and his crew initially picked out a spot on the mountain that appeared flat to allow the Chinook to land. Fuel was a concern, Ford said. The gas tank had 2,700 pounds of fuel left, roughly one-third full and good for about an hour. They estimated the entire operation from liftoff to touching back on the ground would take 30-40 minutes. They would then have to refuel at Troutdale Airport. “We knew there wouldn’t be time for taking in the sights,” Ford said. Once they circled the mountain, it was clear the initial landing plan wasn’t going to work, Ford said. The proposed spot they thought was level actually had a 30-degree slope and wasn’t wide enough for the Chinook to land flat. They found another snowy spot just below the crest of the Pearly Gates area near the summit. Ford said he and the co-pilot decided to perform a pinnacle maneuver, where the front end of the craft hovers with only its rear wheels touching down. Ford said it’s a routine move that he’d had been training for over his 16 years of aviation experience, which includes serving in the Army. Ford estimated there was 40 feet between the pilots and the back of the Chinook. Without rearview mirrors, he had to rely on other crew members to make sure the back wheels touched down on the mountain and the rotors were far enough to avoid the mountain and any rescuers. Ford said three crew members helped guide him via radio as he flew backward. The entire rescue was a team effort, he said. Once the back wheels and the tail of the helicopter hit the snow, the Chinook felt stable. The plan was then to keep the nose of the craft as still as possible while people got on and off the aircraft. Each time a person was added or subtracted from the plane, flight controls had to be adjusted, Ford said. If the nose dropped too much, for example, the Chinook could’ve have slide down the mountain. A 3-foot ramp was used to bridge between the mountain and the plane, Ford said. The pararescue squad met up with the climber and the six mountain rescue volunteers with him, and then they all crouched or crawled onto the Chinook. It took two and a half minutes for everyone to board. The Chinook had 900 pounds of gas left when they landed in Troutdale to refuel. Ford said he didn’t talk to the climber. He said he and many of his military colleagues have been impacted by suicide in one way or another.